Datuk Prof. Emeritus Dr. Alex. E. Delilkan, a national cricketer from 1955 to 1972 and the national captain from 1959 to 1972, a member of the Olympic Council of Malaysia (OCM) Hall of Fame, in his famous no holds barred approach, delivered his thoughts on Combining Sports and Education on Careers for Life, yesterday morning. Alex Delilkan, as he insists to be called among the sports fraternity, who turned 75 young on Feb 12 (as he also insists to use instead of old), had the 30-odd present for the talk at the edge of their seats with his revelations, frankness, wit and humour. Sadly none of the main stream newspapers were present for his presentation. He started off his talk to say that everyone has to accept that Malaysian society is POLARIZED! "Until and when you come to terms that Malaysian society is polarized, we cannot change our standards of sports in the country. Just look at USA in in team games, there are no where! It is impossible for them to perform as a team. But in individual sports, they excel. This is the same scenario with Malaysian sports. Gone are the says when we competed in sports for the love and honour of the country. Sports then was amateur status. Today it is fully professional and it is a fulltime. I achieved great results in both academic and sports on parallel terms. That is no longer possible. We will be kidding ourselves, we we believe we can." Several people disagreed with Alex during question time that sports and a career cannot be achieved. 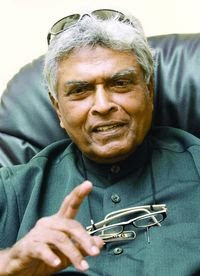 One of them who disagreed was Datuk Dr M. Jegathesan, who he himself was successful both as an athlete and academician. Jegathesan said: "Many athletes world over are successful as an athlete and sportsman. Many of the athletes from these countries get merit points for being national athletes and can defer their studies while concentrating on sports." Alex replied: 'That is exactly what I am trying to say. You cannot achieve success both as an athlete and student on parallel perimeters. Sports is a profession by itself today. It is professional." To another question as why team sports like soccer and hockey had done well in the 50s, 60s and even 70s and now he says they will not do well, he replied: "Back then, we never thought of us being different as we all considered ourselves as one, playing for the love of sports and nation. Sports was 1 Malaya then. But today, polarization starts in the schools!" Asked can this situation can be overcomed, he simply replied: "Go back to the schools. Emphasise sports in schools. Change the system and sports is the unifying factor. Be serious about it. But let me tell you, it is culture you have to change and that is going to take time. 50 years maybe! That is the truth, believe it or not. And the club system must exists. If we think we can correct the present ills by just focusing on schools sports alone, you are grossly mistaken, Schools athletes can become national athletes overnight. They have to go through a system too. But even before the schools, parents play a great role. They have to encourage their children to take up the sports culture. Sports cannot be forced down on anyone and hope to see them become champions. Sports must naturally. Besides talent, the individual must love sports. Athletes will also face many obstacles where teachers or lecturers will play a stumbling block to the advancement of their sports career. They have to overcome all these. Basically sports culture starts from the home to schools, schools to club competition, from club competition to State level and then to national level. These we start specialising at the pinnacle when things are not right at the grassroots level, we are only heading for disaster." Meritocracy: Selectors and coaches must be former national athletes and NOT the president who does not have a clue of the game or which side to hold a racquet. Yes politicians, people who have clout are necessary for the image of the assocaition and financial standings. But they should refraine from being involved in the actually management of the sports. I also do not believe that we should hire foreign coaches. Out coaches knows best, especially when it comes to people management and local situations. And I do not like to call them coaches. Coaches are for schools. At the highest level, they should be managers, who manage the athletes, give advice, motivate them and bring the best out of them. If we need foreign assistance, it should be for specific areas which we need to strengthen. The overall running of Malaysian teams should be by local ex-national athletes of the respective sports. I say do not look West or look East. LOOK HERE! Sports Schools: Why specialise when we do not have out house in order at the grassroots level. Fulfill the basic needs first become looking at specialising. Sportsmen and women: Sportsmen and women cannot be manufactured. Sports has to evolve! Ex-internationals: Get them involved, be it at grassroots, development, coaching or managing. Ex-internationals can help the shortage of sports teachers. Recognise them. At the same-time I agree some of them do not want to be involved. Get around it. There is a wealth of experience out there. Utilise them! Last words: Inculcate love for sports! His famous line:His reply when asked how old he is: "I was born on 12th Feb 1934. Making me a ripe 75. Whenever anyone asked me my age, my earnest reply today would be:- "I am 75 years YOUNG!". Age is a number, how old you are is not relevant, it is how much you are functional and what legacy you leave. Today I am still fully functional, still teaching and guiding the young medical minds." Professor Emeritus of anaesthesiology and critical care, Alex, has been in Universiti Malaya for over 40 years and is an ICON for both medicine and sports. For those who were present at today's talk, it was indeed an honour to be addressed by him. For those who missed the opportunity, if you ever get another opportunity, make it a MUST to attend. I tend to agree with Prof. Emeritus Dr. Delikan. No matter how much we say we can balance sports and education, it does not happen. We have the choice to excel in one area and give our best. Sports run in the previous decades is so much different as how it is run now. Yes,people cannot afford to volunteer time and effortas before coz everything costs money even travelling to the nearest training centre needs petrol. Even worse when people are not transparent and accountable in running the associations, why does one need to go through the stress and all the red tape just to produce athletes. Worse still when people do not appreciate the efforts put in to identify such talents. a lot of old timers are still living in the past... talking about the 'good ol days'! Sorry to say, Malaysia is no longer the same country. Malaysians no longer feel passionate about just being Malaysian. Malaysia is full of rhetoric and not enough substance. Wonderful slogans... crappy reality. The Ministry of Education can cut spending for MSSM sports and schools and PTAs keep quiet... not even a general sense of alarm or concern. Cos more sports mean more work! Tak nak la! Ask most teachers and they are happy with less sports. Why stand in the sun for some 13 year old to run around? Great take on him. I know Alex personally and he is one who takes no prisoners in his thoughts and actions. While he is a fire brand, he is not hollow. He will speak his mind and thankfully his words of wisdom come with hard hitting truth. there are times when I have disagreed with him on many issues but in this case his points are valid. The sad fact is I grew up when we used to idolize national soccer players, we thought of them as players and never thought how many Malays, Chinese or Indians were there playing for the country. However the older i got, and having suffered from polarization and discrimination in the private and public sectors, my eyes became clouded by race when I looked at the soccer/any team selection. Malaysia were like in the top 8 Asian sides in the 70's, but where are we now? Why is that so? So many good non Malay players have been sidelined thanks to some great wisdom of our FAM. People are no longer looking at the overall performance rather than WHO and What RACE is being selected. Until this is changed by all , from the administration, to the teachers and parents, then can we reform our schools accordingly. PM please open your eyes and smell the roses when it comes to 1Malay-sia.